Runeberg's torte (torttu) is a Finnish pastry flavored with almonds and rum. The torte got its name from the Finnish poet Johan Ludvig Runeberg (1804–1877) who, according to the legend, enjoyed the torte (baked by his wife Fredrika) with punsch for every breakfast. 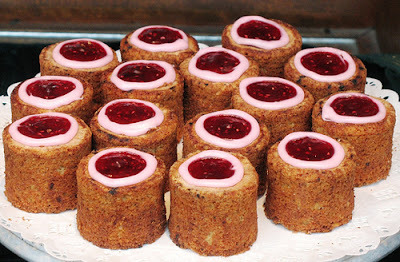 Runeberg's tortes are typically eaten only in Finland around Runeberg's birthday on February 5th. Mix oil, sugar, yogurt and almond essence. Mix remaining ingredients in a separate bowl and add them to the mix. Split the batter to cupcake molds and bake in the oven 190Celsius / 375Fahrenheit for 20-22min. They are ready when you stick a toothpick in them and it comes out dry. Let them sit and cool off completely before starting to decorate. Add 1/2 the sugar to the water and mix until smooth. Add rest of the sugar until you have perfect consistency; stiff, but just a tad runny. Dig a small hole in the middle of the tart for the jam to go in. Size of the hole varies depending on how much jam you like. I like a ton so my hole gets pretty big. Prepare the frosting and put it in a pastry bag and cut one edge open so that you can add frosting around the hole you just dug. Fill the hole with raspberry jam (or any other jam you love if raspberry isn't your cup of tea). And the small birds' tender bevy? Thanks for the recipe! I haven't tried making these yet, maybe this year I should. :) Let's hope you get your oven fixed soon. Kiitos reseptistä, jospa saisin itsestänikin irti kokeilla tuota :) Mutta huomenna ravintolapäivänä on Animalian toimistolla Helsingissä yhden päivän tapahtuma Cafe Animalia - Vegan for life. Siellä ajattelin maistaa vegaanisen Runebergintortun, toivottavasti niitä riittää!